I have spent most of my life in Leith and love to take advantage of what Edinburgh has to offer, particularly food and drink! There is no such thing as bad whiskey. Some whiskeys just happen to be better than others." The Scotch Malt Whisky Society is an independent bottler of whisky and membership organisation that is open to the public to join. This article is intended as an insight into the benefits of membership and the world of single cask, cask strength malt whisky. In the late 1970s a certain Philip 'Pip' Hills was holidaying in the Highlands of Scotland and was amazed by a bottle of cask strength whisky that he purchased from a local farmer. Finding that there was nothing comparable in the shops, in 1978 he arranged with some friends to buy a cask from the Glenfarclas distillery. A syndicate developed from these humble origins, regularly buying and bottling casks for distribution to subscribers. In 1983, realising that there was a gap in the market, some of the members purchased the first Society venue, the Vaults in Leith, and opened membership to the public. Today the Society boasts three UK venues, branches in 16 countries and more than 26,000 members internationally. For UK residents membership currently costs £110 though it is around half this amount to renew each year. 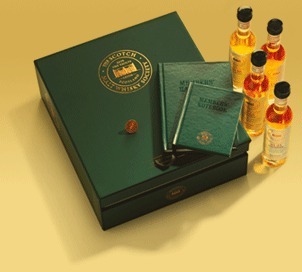 The introductory membership pack includes four 10cl miniatures and a handbook that explains the workings of the society. The Society sends out regular updates on new releases and the Society's magazine 'Unfiltered' is mailed to members each quarter. While the fees may seem expensive, the use of the venues and the opportunity to try whiskies before you buy is rare and a valuable benefit in its own right. The Society also sometimes issue invites to free preview tastings to those who frequent the venues and make purchases. However it is also possible to buy whiskies from the SMWS Web site and access to the Society's whiskies is worth the price in its own right for many people. People are often surprised to learn of the industrial processes that most single malt whiskies on the market go through, for example chill-filtration. This removes elements that can cause clouding when water is added but can also impair the flavour. Most whisky is also watered down to around 40% and coloured using the additive E150 (caramel). When the Society first started the unique selling point was that every bottle is from a single cask, is cask strength and is unadultered in any way. This also means that each cask release has a unique character and is limited to only a few hundred bottles. Each month the SMWS release a new series of casks called the 'outturn'. Although these are usually whiskies, the Society occasionally releases rums, Cognacs, Armagnacs, and even special editions of port at Christmas. In all 129 whisky distilleries have featured among the malt whisky releases though some are seen with more regularity than others. The Society does not issue bottles with the name of the distillery on the label, instead they use a numbering system. This is necessary because producers go to great lengths to create distinctive 'expressions' (essentially a house style) for each distillery and some would be unhappy with the distillery name being on a bottle that might be unrepresentative of the expression. The number system is double-barrelled: the first part represents the distillery; the second represents the cask. For example a bottle with the number 29.121 means it is the 121st cask that the Society has released from distillery 29. This can be a little bewildering to new members, especially if you are a relative whisky novice. However the bar staff is happy to make recommendations based on your preferences and, if buying online, detailed and idiosyncratic tasting notes are provided. Besides, a quick Google search can reveal the number of a given distillery! I joined the Society when my wife bought me membership one Christmas. I imagined that it might be a world of old men in tweed jackets but this couldn't be further from the truth. There are many young members and I understand around a quarter of members are female. Before I joined I was certainly keen on whisky and had a rudimentary knowledge of the whisky regions and expressions. However membership of the Society has really kindled my interest and, while I may never claim to be an expert, I have learned a great deal about the industry and the product and I have really enjoyed my society journey so far. Membership is a great gift to anyone with even a passing interest in whisky, whether for yourself or for someone else! If you want to learn more look out for my follow up reviews on the Edinburgh venues or check out the Society Web site at www.smws.com. Why? A world of exclusive whiskies!